From virtual job fairs accessed through Web sites to 3-D facilities constructed in virtual worlds such as Second Life, job seekers are finding interactive and rewarding paths to follow for securing employment. And well-established companies in the employment services industry are helping to blaze the trail. 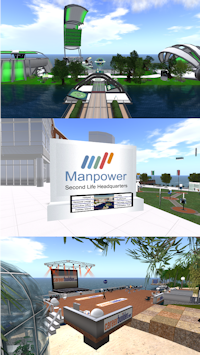 Within the last year, Manpower Inc., Kelly Services, and CareerBuilder established virtual spaces in Second Life that offer employment resources and job information. Companies are beginning to realize attracting new talent means sharing the same online spaces. 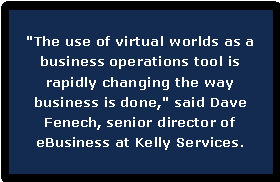 "The use of virtual worlds as a business operations tool is rapidly changing the way business is done," said Dave Fenech, senior director of eBusiness at Kelly Services. "As the virtual world continues to evolve, benefits will quickly move beyond the marketing, branding, and customer relationship enhancements. Early adopters of virtual technology can secure a lasting productivity advantage through enhanced collaboration, team building, and enterprise-wide innovation." Kelly Services, headquartered in Troy, Mich., has been providing staffing solutions for over 60 years. Today the company operates in 33 countries and territories helping to facilitate employment for over 750,000 people each year in many different industries. Last year, the company set up virtual headquarters in Second Life on a group of three islands and was one of the first companies to place a Second Life resident in a real life job. One of the islands owned by Kelly Services emulates an online game on their Web site (http://www.findfrankajob.com/). Another island serves as a sandbox, and the third island hosts the company’s virtual headquarters, a concert hall, an expo center, a stadium, and central hub. Throughout the year, Kelly Services hosts seminars, conferences, job fairs, interviews, and training. Other features, set up near the headquarters building, include scenes representing several real-world jobs in nursing, office work, information technology, and laboratory work. Each scene is set up to animate three different tasks; by working at these tasks for 15 minutes, avatars receive a gift related to that job. As more time is spent working, avatars are “promoted” and given additional items. Each scene distributes a total of four gifts related to that particular job. Four job boards are also located near the headquarters with listings of jobs in the healthcare, information technology, science, and office services industries. Available positions include specimen processors, chemist, support engineer, and medical billing/administration staff located in cities around the world such as Buffalo, N.Y., Baton Rouge, La., and London. Each listing has a link to a Web site detailing more job information, salaries, and hours. Kelly Services supports the company’s virtual build with a Web site at http://www.kellysecondlife.com. Staffing services are even provided for companies operating in virtual worlds. Virtual establishments searching for employees can fill out a form on the site requesting help in filling job vacancies. Kelly Services will hire and train employees for these positions on a temporary, part-time, or permanent basis. Manpower, like Kelly Services, was founded in the upper Midwest more than 60 years ago, and like Kelly Services, this company established a virtual presence last year on an island in Second Life. The company’s island, Manpower HQ, hosts an auditorium, orientation trail, Holiday Island, and a main building with a lounge, executive office, and lobby. In the lobby, avatars can obtain information on virtual work, defined by Manpower as work done outside of the traditional physical office or work space, and can pick up some tips for customizing their avatar and purchasing proper clothes for an interview. CareerBuilder Inc., the new kid on the employment services block, was established in 1995 under the name NetStart Inc. In 1998, the company assumed its present title and launched a Web site at CareerBuilder.com. With its background firmly established in the beginnings of the Web, CareerBuilder wasted no time in jumping into the virtual world environment. “CareerBuilder entered Second Life just about one year ago for a three month pilot test with kiosks throughout Second Life,” said Ellen Miehl, senior affiliate marketing manager for CareerBuilder.com.